Canada’s reigning Magazine of the Year Corporate Knights is not resting on its laurels. According to a story in Masthead Online, the magazine’s latest issue is printed on 60% wheat straw “paper,” which its editor Tyler Hamilton says may be a more sustainable product to meet printing needs in the future. 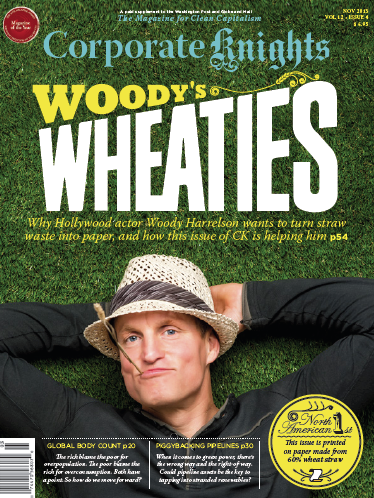 The latest issue of the magazine features American actor and entrepreneur Woody Harrelson, one of the founders of Manitoba-based Prairie Paper Ventures, which produces the wheat straw stock. Read the story over at Masthead Online.